Tony Stewart's Original Beef Jerky is a brand of Tony Stewart's Original, Inc. based out of Indianapolis, IN. It bears the name and likeness of the famed racecar driver, leveraging his star power to earn some extra income through the sales of jerky, salsa, and barbecue sauces. The package goes on to say that it was made from Argentinian cattle, but further processed in the USA. Tony Stewart's Original Beef Jerky also includes a teriyaki variety, which I'll be reviewing some time later. The first thing I taste off the surface of these pieces is a light sweetness, a slight smoky flavor, and a bit of black pepper. There's also a chemical-like taste on the surface as well. In the chewing, I get some saltiness, and a bit more black pepper. That's about it. 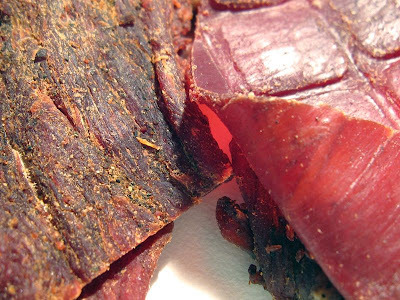 Overall, the flavor is rather bland as far as jerky goes, having a low-to-moderate intensity, and very little spice aside from the light black pepper flavor. I'd say the one flavor component that dominates throughout is the sweetness off the surface. It mixes into the chewing for a ways, until about half-way through when it seems to wear off. The saltiness then seems to rise above, and varies from light to medium in intensity. There's a light smoky flavor noticeable on the surface, and continues throughout the chewing. The black pepper flavor is noticeable throughout, but seems to remain light in intensity. There are no natural meat flavors to be found. 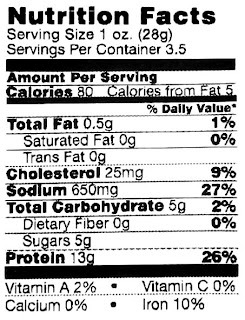 These appear to be slices of whole meat, in medium thickness, and in small to medium sized pieces. It's a semi-moist jerky, being soft and tender to chew. They have a moist feel on the surface. Tearing pieces apart with my fingers seems easy. The chewing texture starts out with a moist, but chewy feel, and chews down into a mushy mass in about 20 seconds or so, but never really feels like a steak due to it being mushy. It's a soft, mushy chew mostly, though some pieces did have a more fibrous feel. That one piece you see in the photo, looking thin, smooth and shiny, seems to be an abberant piece that perhaps fell into the wrong conveyor belt or something. It's very chewy, with a rubbery feel, but eventually chews down into something more steak-like than the others. However, it has almost no taste, aside for a bit of saltiness. A few pieces had some visible chunks and streaks of fat, and I found one piece with a large streak of gristle. Aside from that, nothing else chewy or unchewable. These pieces do drop a fair amount of fragments as I tear them apart, but my fingers don't pick up any residue from them. 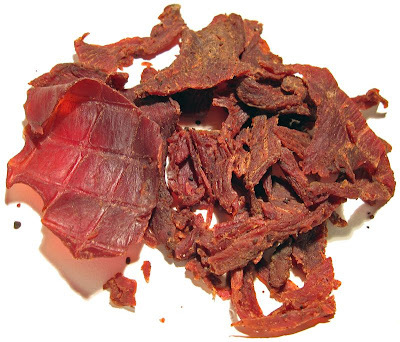 For general jerky snacking purposes, at the $1.70 price per ounce, it presents a weak value. I'm not really getting much snackability out of this, only a little. There's some flavor in here, but not quite enough to get me interested in this jerky. You could eat this to keep your jaws busy while doing something else, but assuming you're a jerky lover like me, I don't think you'll buy this again after the first time. This original variety of beef jerky from Tony Stewart's Original just doesn't provide much snackability for me, mainly due to its weak flavor. Overall, it's light on taste, and even as far as taste goes, it's rather bland having a light taste intensity, and low taste complexity. There's little here to interest me. The meat consistency was ok, being soft and moist, but the chewing texture was more mushy than anything else. The fact that I found a large streak of gristle on one piece, and yet another piece (thin, smooth and shiny) that was out of place, suggests there's little effort to ensure quality. Not necessarily a great choice for meat snacking, but if you're a Tony Stewart fan, I'm sure you'll just have to try it. For a good beer recommendation, I'd pair this up with an IPA.